Please refer to the specific individual sections for some description, overview, and functionality of each feature. The source for both UNET and Photon versions of brainCloud Bombers can be found here. In brainCloud Bombers, players can earn experience for destroying enemy planes in-game. Experience is awarded at the end of each match, and kept track of on the brainCloud servers. Players can view their total experience on the Matchmaking menu, beneath the player’s name. brainCloud also has custom levels defined, each having an experience value and a name. Players can see their current rank (as well as its numeric value) on the Matchmaking menu, beneath the player’s name. Experience is incremented live, so brainCloud sends messages to clients when they have made it to the next rank. This is shown to the player through a dialog that appears at the end of a match. Experience and levels can be read through the PlayerStateService in the brainCloud API. The call returns the current player’s experience level and rank name/numeric value, all of which are saved as public member variables in the BrainCloudStats class. These stats are updated live on the brainCloud server, but on the local client they are only updated when the player visits the Matchmaking menu, reducing the number of API calls required per user. Every player in brainCloud bombers has a number of custom statistics that are stored on the brainCloud servers. These statistics include the number of ships they have sunk, the number of times they have fired their weapon, their total number of wins, and more. These statistics are updated at the end of each match. Players can view their statistics on the Matchmaking menu, where they are shown on the left side, below the player’s name. These statistics were created on the brainCloud design portal, and can also be edited from the monitoring section of the portal for each user. Player statistics can be read through the PlayerStatisticsService in the brainCloud API. The call returns all of the current player’s statistics, including the statistics’ name, value, and description (all defined from the brainCloud dashboard), of which only the value is saved in public member variables in the BrainCloudStats class. These stats are updated live on the brainCloud server, but on the local client they are only updated when the player visits the Matchmaking menu, reducing the number of API calls required per user. brainCloud Bombers has two separate global leaderboards defined, that players may view at their leisure from the Matchmaking menu. The first leaderboard keeps track of the number of enemy plane takedowns that each player has, with the least number of deaths as the tiebreaker, and the second leaderboard keeps track of the number of ship weak-points destroyed by each player, with the least number bombs dropped as the tiebreaker. Both leaderboards feature the player’s place in the leaderboard, name, their rank (and numeric value of rank), and score. brainCloud keeps tracks of all aspects of the leaderboards, and scores are updated at the end of each match. 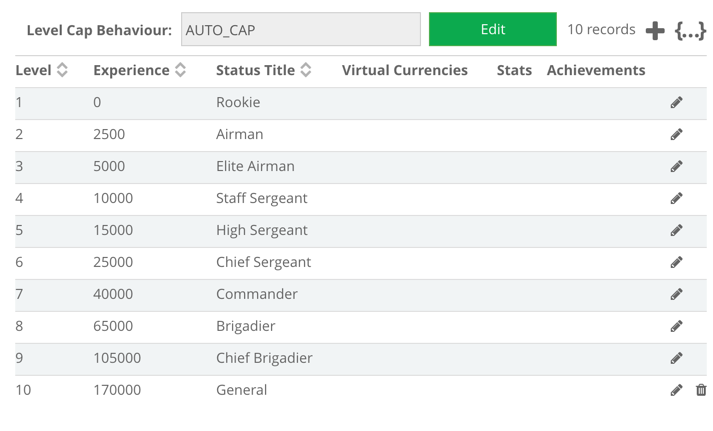 Leaderboards can be accessed through the SocialLeaderboardService in the brainCloud API. The call returns the entire listing of a given leaderboard, or can be broken up into just the current player’s score, or individual sections of the leaderboard with variable length. The values for the currently observed leaderboard are stored as a public member variable in the BrainCloudStats class. The leaderboards are updated live on the brainCloud server, but on the local client the leaderboards are only fetched when the player wishes to see them from the Matchmaking menu, reducing the number of API calls required per user. 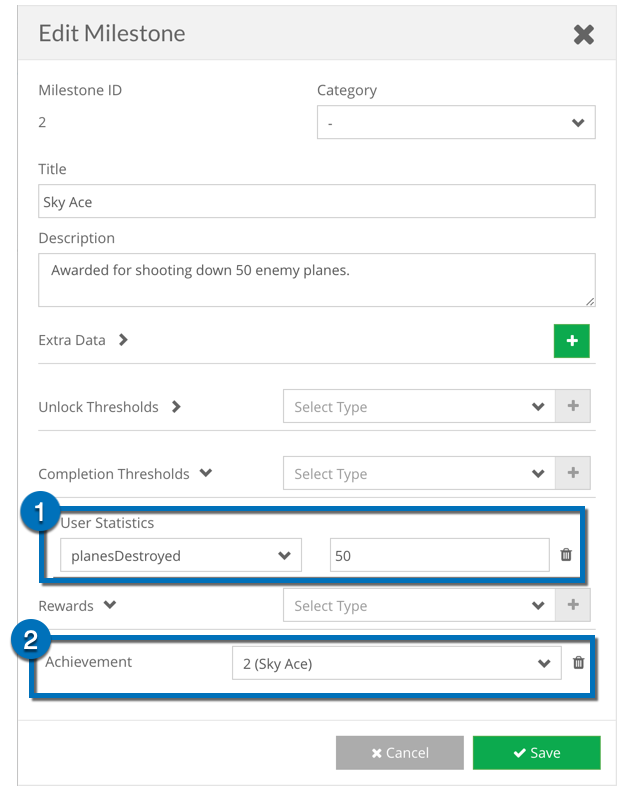 Achievements can be accessed through the GamificationService in the brainCloud API. The call returns all of the achievements in the system, their names, the urls for their icons, their descriptions, and whether or not the current user has unlocked any of them. The achievement data is stored in a public member variable in the BrainCloudStats class. The achievements are updated from the server when the player visits the Matchmaking menu. 1. When this condition is satisfied. brainCloud Global Properties can be used in place of constants in your games – allowing games to be tuned and/or patched on the fly without having to release new builds. A number of properties have been utilized in brainCloud Bombers, to tune such things as player fire rate, respawn time, bullet speed, player health, and more. These properties can be read through the GlobalAppService in the brainCloud API. The call returns all of the currently saved global variables, which are then stored as public member variables in the BrainCloudStats class. To reduce API calls from the client, these values are only read once when the game is started, meaning clients will need to restart the app to get any changes, but they could be checked more often for the sake of app security or faster testing. brainCloud Bombers requires users to sign in with an email and password, with the authentication being done through brainCloud. If a player uses an email that hasn’t been registered, an account is created for them and an authentication email is sent to the email address used. 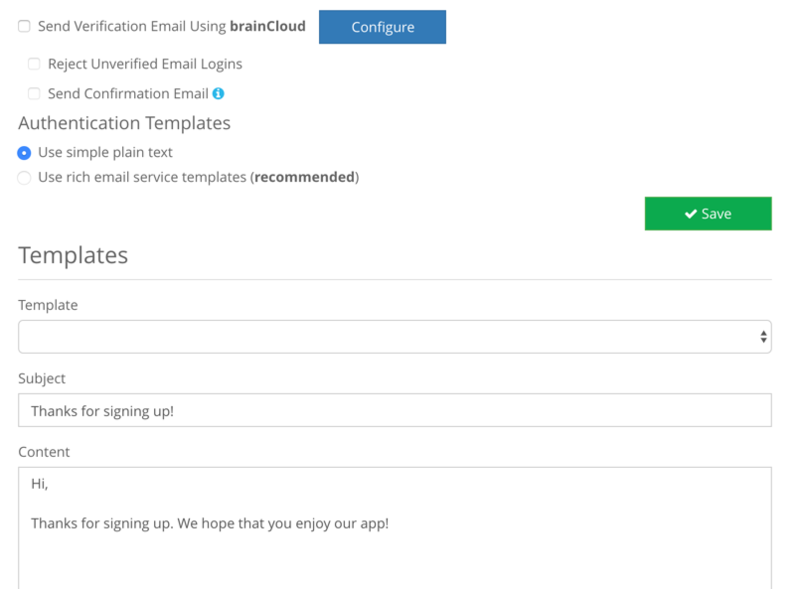 brainCloud also has the ability to require email authentication before being able to log in, though this feature is turned off for brainCloud Bombers. Players may also submit a “Forgot Password” request from the login screen, prompting them to enter their email and sending a password reset link to the entered email. User authentication is done through the BrainCloudWrapper instance, and is taken care of on the server end. The server will send a message back saying whether the authentication was successful or not, and the error that occurred if it wasn’t successful. Since brainCloud Bombers uses external servers (UNET or Photon), the player must wait until they are connected to their servers before logging in to brainCloud. This requirement is optional; the services do not depend on each other – this is done under Design | Authentication | Email Authentication. The source code for brainCloud Bombers can be found here. GAME_STATE_SHOW_ROOMS: Shows the main matchmaking menu, allowing the player to join games, create games, view the leaderboards, view the controls, view their achievements, and shows the player’s stats. GAME_STATE_SHOW_ACHIEVEMENTS: Shows the available achievements for brainCloud Bombers, and tells the player whether they have achieved them or not. Checks the multiplayer server for open rooms, and allows the player to join any room that is not full and within their level range.